You can type Malayalam content easily by following this tutorial. Malayalam language is the language spoken in Kerala, whats known as the God’s own country. But if you reached this page via Googling for the methods for the same, then you already know that. Without further introduction or detailing about the language, let’s just skip to the part about the best way to create Malayalam content in any platform. Now when it comes to Malayalam typing, some people use their computers, which is the fastest way to type, and some other use their mobile phones. Most smartphone users are using Android OS and there are plenty of tools available for Malayalam typing. Majority of the Malayalam writing tools use an English to Malayalam conversion tactic. That is, you are actually typing English words and the tool will convert them into Malayalam writing. When it comes to web based tools, Google is always one step ahead of everyone else. Google has just the best tools to type up Malayalam content online. Now this is a web based tool, so you need active internet connection to use it. This one is best for those who only type Indian languages less frequently. Also you don’t have to waste any memory by installing typing tools in your system. After typing, you will have to copy the content and paste it to wherever you want, let it be Facebook, Twitter or any other content sharing platform in which you intent to share the matter you just typed. Try out Google input tools now. When you open this page, you can select the language in which you want to type. Simply select Malayalam keyboard from there and you are good to go. Just start typing and Malayalam words will begin to appear. Note: This is an online Malayalam typing tool. You need to be connected to internet. This tool won’t work offline. It might be annoying to type the content in one page and then copy paste it to another for some people. Especially those who are extremely active in social medias. For people like them, something faster to access is more desirable. 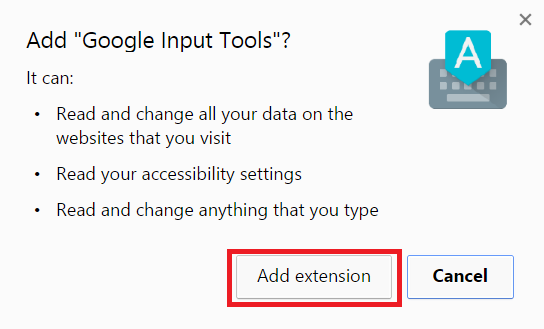 Google input tools extension is available to download. Now this one is exclusively for Google chrome users. So Firefox and Safari users can skip to the next tool and keep on reading from there. When you install input tools in Chrome, you will see a keyboard icon on the top left corner of Google chrome. Click on it and it will ask for permission. Give the permission and you will be redirected to a page in which you can select the languages. Find Malayalam keyboard from the list and then click on the arrow button at the center of the page. It will be added to the language you want to type using Google input tools. Once you have selected the language, the next step is to click on the top left corner icon again and then click on “മലയാളം” from there. This will enable the Malayalam keyboard. After that, you have to go to any page in which you want to type. Lets just say you are trying to post something on Facebook. Simply go to Facebook, click on the typing field and start typing. Malayalam language will automatically appear. Surprisingly, the third option for Malayalam typing online on your computer also comes from Google. 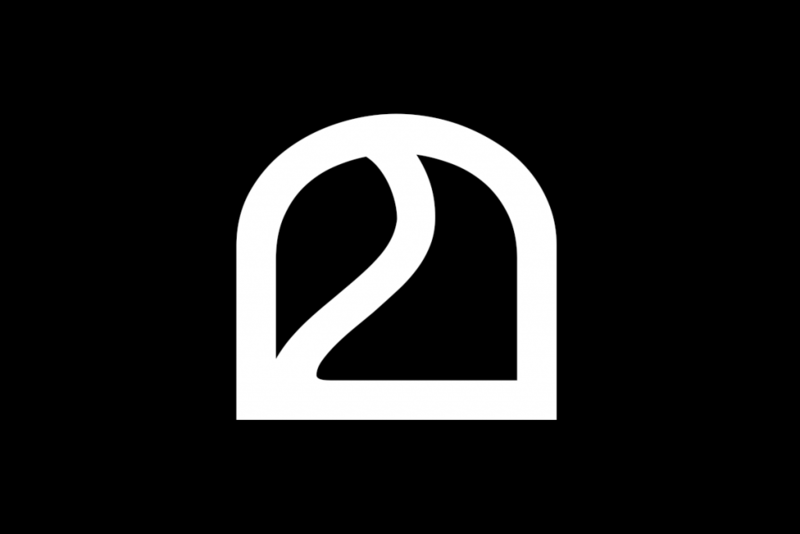 You can download the tool from here and install it in your system. Take note that you need Windows XP,Vista or 7 to run the tool. Google handwriting keyboard is a recent app from Google. It is so simple to use. Just write on the screen using your finger or a stylus pen and it will recognize the patter and identify the character you have written. You can type a whole word or individual letters as per your needs. Download Google Handwriting Keyboard From Here. After downloading, the app will appear in the app drawer. Open it and then you have to download Malayalam language into it. After downloading and setting up the app, simply go to anywhere you want to type and then long press on the space bar. A list will appear. Select ‘Malayalam’ from the list and you are good to go. Note: to switch back to English keyboard again, simply long press on the space bar and change language. 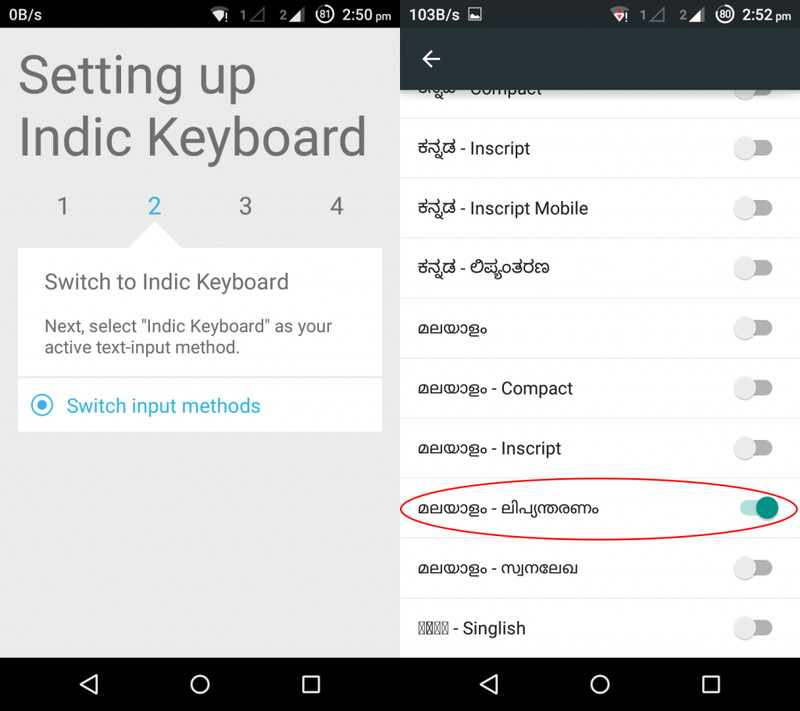 Indic keyboard is somewhat similar to the Malayalam input tools we described for PCs. You can type English letter in your keyboard to get Malayalam in your PC using those tools. 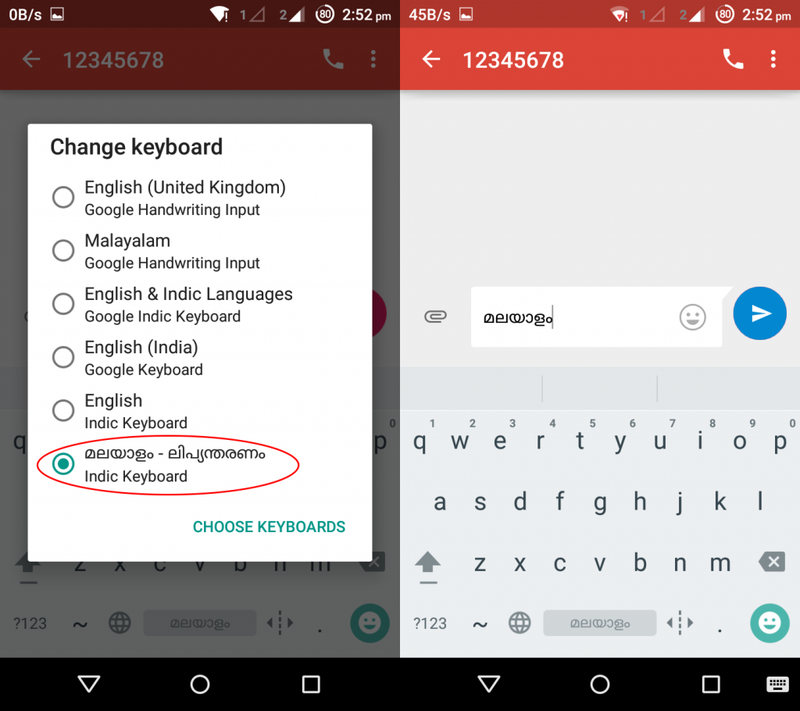 Similarly, you can use your virtual English keyboard in your smartphone to create Malayalam content using Indic Keyboard. Download and install the application from here. After installing, open up the app and follow the onscreen instructions to enable the keyboard, select the languages and set it up. Just enable the options displayed in the screenshot and you are good to go. We have shared a few methods to type Malayalam content in both your PC and smartphone. Kindly note that there are many other tools available on the internet which will help you to accomplish the task. However, what we shared is what we feel like is the tools which is highly reliable, user friendly and easy to use. Do let us know about your favorite tools for the same via the comments section. 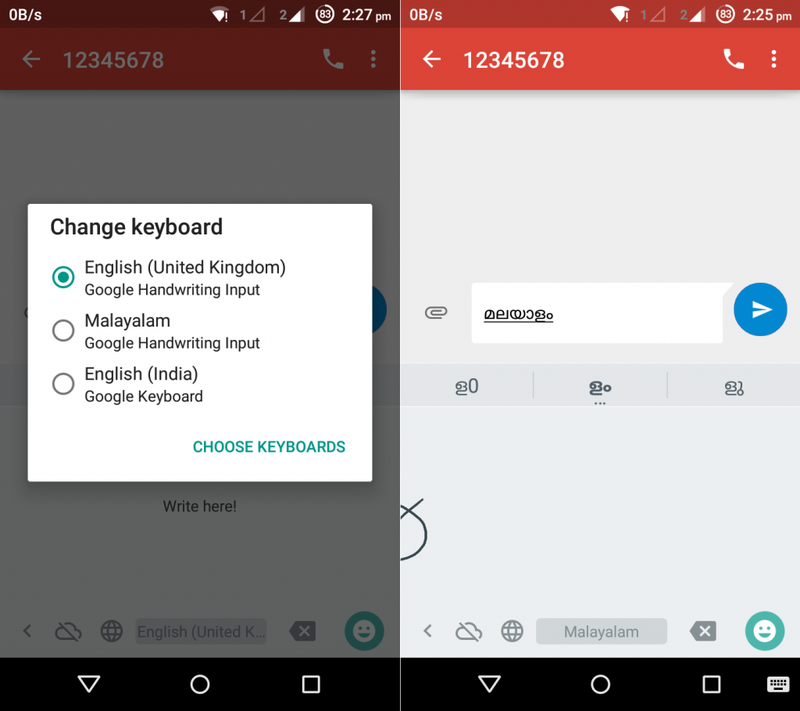 Update: Google has come up with a new voice input tool which you can use and just talk Malayalam. The tool will convert it into text. 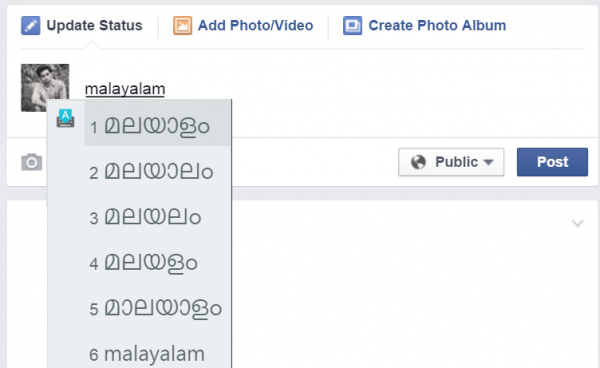 I was searching for a method for malayalam typing in Facebook. Looks like you have many methods listed out here. Thank you very much for the post. I’m going to try the online malayalam typing tools for now. ദയവായി കീമാജിക് (KeyMagic) എന്ന സോഫ്റ്റ്‌വെയർ കൂടി ഉൾപ്പെടുത്തുക, ഓപ്പൺ സോഴ്സ് ആണ്. കസ്റ്റമൈസബിൾ ആണ്. KEditor എന്നൊരു ലേയൗട്ട് എഡിറ്റർ അതിനോടൊപ്പം വരുന്നുണ്ട്. അല്പം പ്രോഗ്രാമിംഗ് വശമുള്ളവർക്ക് സ്വന്തം കീമാപ്പ് ലേയൗട്ട് അതിൽ ഡിസൈൻ ചെയ്യാം. ഏതു കീ അമർത്തുമ്പോൾ ഏതക്ഷരം വരണമെന്നും ഏതെല്ലാം അക്ഷരങ്ങൾ ഇടതുവശത്തുള്ളപ്പോൾ ഏതു കീ അമർത്തിയാൽ ഏതു കൂട്ടക്ഷരമായി അതു മാറണമെന്നുമുള്ള റൂൾസ് പറഞ്ഞു കൊടുക്കാം. Thank you for the valuable information. We’ll revise the list and include this in the updated article.